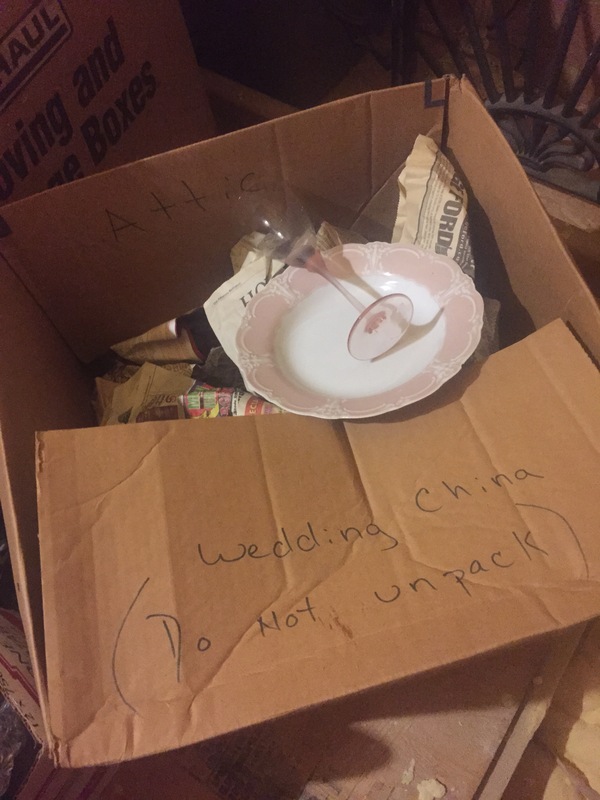 I wonder how many times we moved before I finally thought to label the box so it would go straight to the attic? It’s wedding season. Not only is this the time of year people get married, but it’s also the season of my life when a lot of my friends’ kids are getting married. So, I’m spending a lot of time hanging out online perusing (and apparently judging) wedding registries. You can tell a lot about a girl’s plans by her wedding registry. So representative of the elegant life the young bride is envisioning for herself. So sweet, so naive, so hopeful. I couldn’t help but find myself wondering how these girls might feel in about 30 years about the items they registered. I registered for pink china. In my defense, pink was considered rather chic in 1984. I wouldn’t go so far as to claim the color was a neutral, but it did pair nicely with navy and mint green – my accent colors. I registered and received several thousand dollars worth of china that I’ve used twice in 33 years. Once for an Easter dinner and once for an “It’s a Girl!” themed baby shower. I notice a lot of today’s sophisticated young brides are opting for cream or white dinnerware. At least they learned something from the 80s. The crystal I selected was equally lovely. The bowl was a clear lead crystal with a frosted pink tulip-style stem. Guaranteed to look lovely with my china pattern. Mind you, these selections were made before Pink Zinfandel burst forth on the wine scene as “affordable and approachable,” (a perfect pour in my pink stemware) but after John Mellencamp’s “Pink Houses” (1984) became a hit and a potential lifestyle choice. I did manage to use my crystal more than I used my fine china. It was all broken by our fourth move and/or our third child. No matter! By the 90s, pink had become synonymous for Breast Cancer Awareness and jewel tones were all the rage on the domestic front. I went to Pier 1 at some point along the way and bought a box of plastic wine glasses I thought were classier than drinking Franzia straight out of the plastic spigot attached to the box. One of my Bridal Showers was themed, “Anything Peach!” You guessed it – guests were invited to bring a gift that was peach colored. That’s a tall order. Looking back, I bet some chics were pretty darn annoyed. I received a ton of peach towels and sheets which, quite frankly, clashed with all my pink. I also registered something my mom called “Silver Plate” eating utensils. It was considered nicer than Oneida stainless, but not nearly as expensive as sterling silver. My mom felt certain I could get all 12 place settings required to be a happy housewife. I got 7, so Doris insisted on helping me “complete the service” for the next few birthdays and Christmases. On my next birthday, I turned 22 and the bloom was literally off the rose. I was completely over the bridal thing. Not to portray myself as a diva, but I remember really wanting clothes and boots on those occasions more than 2 forks, 2 spoons and a knife. Even if they were coated with real silver. The last time I saw a piece of my “Silver Plate,” it was 1/2 buried in our sandbox in Phoenix. This is not to say that I didn’t accidentally register for and receive some practical and useful gifts. My cousin gave me a cheese slicer. I can’t believe I still have it. I think of her every time I use it. Which is often, because cheese goes well with a cold box of wine. I’m not casting aspersions on anyone else’s hopes and dreams. I ordered all 6 of my 2017 brides something elegant off their registry. I’m merely suggesting, in 10 or 15 years it could very well end up in their sandbox. I love this! Even while I was building my registry, I was overwhelmed with that the stores insisted was a “necessity”. While I thought I was being very practical and somewhat minimal, I can count the number of items I still have and use often 10 years later, roughly in order of importance/use…. -China (we first registered for service that was not dishwasher safe, which my sister-in-law wisely instructed us to change). We did use this for a bit before kiddos came on the scene. I will gladly use it again when they are a bit grown and more coordinated perhaps? -Sleeping bags and mats – Best choice we made was to register for camping gear! We even used these once at home early in our marriage when I forgot to dry the sheets before bedtime! We maybe would have some more everyday items but we gave much of it away to friends when we moved overseas for 2 years, 6 years into marriage. I wish I had Cutco knives. So expensive but everyone raves about them! Thanks for reading and sharing!